We now stock both Brown Rock Salt and Pure White De-Icing Salt. Don't be caught out - Winters can be as severe. Traditionally brown rock salt is used as an effective method of clearing snow and ice from roads, driveways and paths etc ! 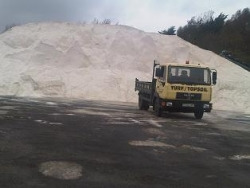 Brown de-icing rock salt is ideal for paths, steps, car parks and roads. It is a mined salt . It protects against re-freezing and will work down to -11c 12f to melt a small layer of ice or snow. We sell it in small 25 kg 55lbs sealed bags or large multi-bags. Customers can collect from the farm or we can deliver. 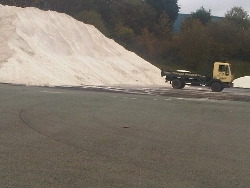 White de-icing is marine salt it is used for the quick de-icing of roads, car parks, steps and pathways. It quickly de-ices areas and leaves virtually no residue. It helps against re-freezing. We sell it in small 25 kg 55lbs sealed bags or large multi-bags. Customers can collect from the farm or we can deliver. Please ring ahead to ensure we are on site and ready to deal with your enquiry.